Ron Marney was a fleet-footed midfielder who played as a rover or wingman. He was a strong and brilliant leader for Glenorchy and Tasmania in the late 1950s and throughout the 1960s. Prior to his ten memorable seasons with Glenorchy, Ron Marney played in the Southern Tasmanian Amateurs for Lindisfarne, winning club and association best and fairest awards in 1956 and 1957 and also enjoying a premiership before beginning his senior career. Marney was renowned as a player who tore into the packs, tackled furiously and had the respect of men twice his size. His football skills were impeccable and an object lesson for all who watched the game. 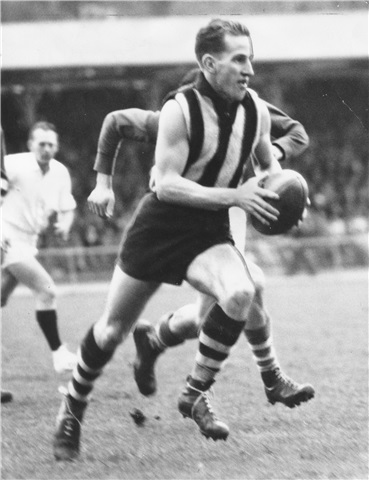 Marney wore the state jumper regularly from 1961 to 1967, but in a memorable victory against Western Australia in 1963 Ron took the field with a depressed fracture of the cheekbone. Coached by Tasmanian Hall of Famers Jack Rough, John Chick and Bob Parsons at Glenorchy, Marney rose to the captaincy of the Magpies and ultimately Tasmania when in 1967 he led the state to a valiant 17-point loss to the might of Victoria. In 1969 Marney ‘went bush’ and coached Kermandie for two years, taking them to a flag and winning a Huon Association best and fairest (Ivan Short Medal). After a return to Glenorchy and a coaching stint with their U19s and reserves, which also resulted in premierships at both levels, Ron Marney retired from the game. None were more competitive, and few have got the record to match one of Glenorchy’s and Tasmania’s most talented and tenacious rovers in Ron Marney.